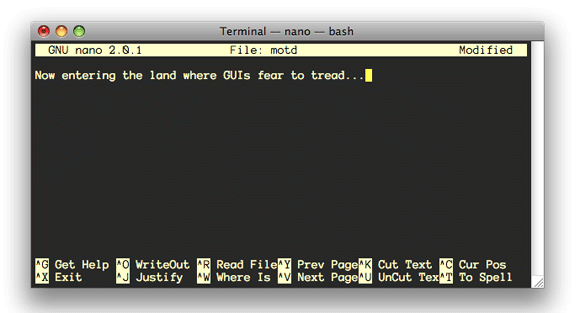 If you’ve used Terminal in OS X somewhat regularly, you’re probably well acquainted with the “Welcome to Darwin!” message that appears when you open a new Terminal window, or connect to your machine via ssh. Or should I say appeared, as the message has vanished as of 10.5—new Terminal windows simply tell you the date and time of your last login. After you’ve come up with the witty words you’d like to use for your message, press Control-O to save the file—nano will prompt you for the filename; just press Return to accept the current value, which is motd. Finally, press Control-X to exit nano. Press Command-N to open a new Terminal window, and revel in the return of the welcome message.